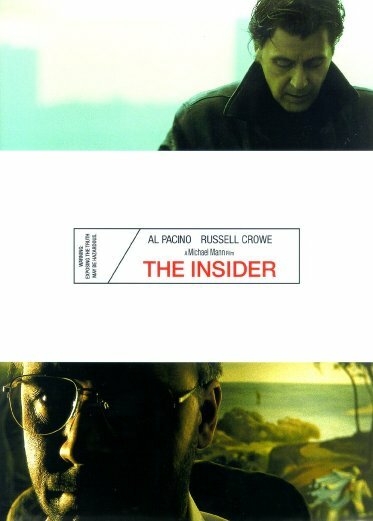 The Insider is definitely one of the best of the year and could very well spurn an Academy Award or two. But regardless of the Oscars, look for this movie to score big in my end-of-the-year awards which are coming at the (you guessed it!) end of the year. The film basically tells the real-life story of the 60 Minutes story on the whistleblower, Jeffrey Wigand, who revealed some of what goes on behind the scenes in this industry of death. Before I get into the powerful message, the brilliant acting, and the insightfulness of the movie, let me start off with what, to me, is the most original and most shocking aspect of the film. This is a "No Smoking" film. Not once does anyone light up. Simply amazing! I would have to say that I would be hard pressed to name for you another movie where the cigarette is NOT championed as the companion to success, heroism, and/or suave sophistication. In fact, this movie drives against the smoking industry which is as much a story in itself than its own plot. 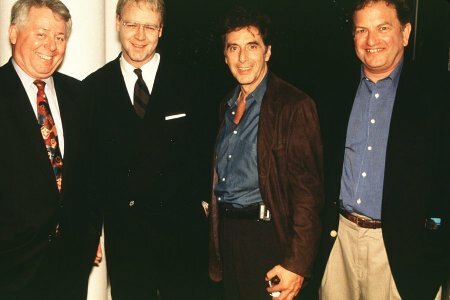 However, perhaps a movie such as this could not be possible if it were not for the whistle-blower (and main character of this film), Jeffrey Wigand, who finally crippled the power of Big Tobacco by bringing its misdeeds into the limelight. Although it was not hinted at here, I guarantee that Big Tobacco has been paying off Hollywood (for years, decades, even more) to glamorize this most STUPID and detrimental past-time. What better way to sell cigarettes than to have people fantasizing that they are just like <Big Name Actor goes here> from the hit movie <Insert any movie except The Insider here> that they just saw over the weekend? Another great aspect of this film is in how it reveals not only the fearsome power of an industry giant such as Big Tobacco, but it also shows us the power struggles that go on inside Big Media. But when you really get down to it, what makes this movie so powerful and so wonderful is that it champions the greatest of themes. Principles, ideals, call it what you will, there is something very passionate and overwhelming when I see someone who believes in something that is bigger than himself. Seeing someone who does not bow down to fear, who risks everything they have in life and hold so dear, all for a cause that they believe cannot be ignored or poisoned by their own selfishness and cowardice. There are just a handful of films like this, and each one has spoken to me its powerful message. This is when seeing a movie becomes not just an escape from everyday life or an exciting vicarious experience, but rather becomes a driving force in getting one to consider his (or her) own ideals and place in life. Another interesting aspect of the film, to say the least, was in its realism. We, "the people", like to believe that the business of the world is going along smoothly according to plan and that "doing the right thing" always gets rewarded. In reality, however, there is much that goes on behind the scenes that we do not know, and probably don't want to know. This movie also reminds us that often times "doing the right thing" is the most difficult and perilous things that one could do. However, while we are on the subject of reality, it is interesting, and somewhat sad, that this movie chooses to dramatize certain portions of this true story in order to make it more screen-worthy. However, this is something that I can live with, because I don't go to see movies for their historical accuracy (I'll watch Biography or the History Channel for that); I go to see them for their effect upon my thoughts and emotions. What was so profound about Crowe's performance was that he portrayed a man who struggled with this decision every step of the way. His character was also very human, having a few character flaws that allowed this movie to refrain from being another "good vs. evil" flick. 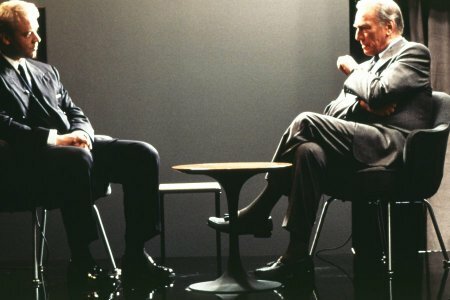 I also enjoyed Christopher Plummer (below) as Mike Wallace (host of "60 Minutes"). His off-screen displays of power contrasting with his smooth on-screen interviews were truly entertaining as well as eye-opening. One of the neatest scenes in the movie was this one (pictured below). Dr. Wigand and Lowell Bergman are discussing the possibility of Wigand appearing on "60 Minutes" to finally blow the lid off of some of the tactics used by Big Tobacco (specifically, Brown & Williamson) to attract and keep their smoking customers. The discussion begins at the table with Wigand and Bergman arguing about the value of doing this. Wigand starts criticizing the media for its warped presentation of reality and how the public only knows what they are presented when, suddenly, the shot below reveals that they are not sitting on chairs, but rather, on their legs! This scene was brilliantly done, showing indeed how our perception of reality is only what we are allowed to focus on by those in control. However, in the end, I have chosen not to bestow upon this film my highest rating due to one thing I feel that was lacking: the music. I believe that this movie could have been made so much more powerful by having an inspiring and haunting score. This movie is one of the best of the year and is definitely a must-see. 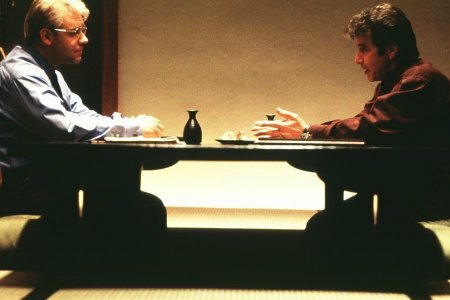 How would you rate the movie The Insider? There have been 15546 people to visit this page since Sat, Dec 4, 1999. And you are the first person to visit this page today!